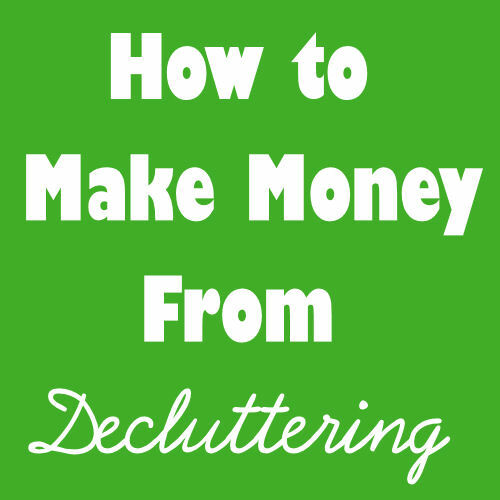 Decluttering has help me stay organized, changed how I spend money, and given me a peace of mind that comes through living more simply. It was a long emotional journey that taught me to be true to myself. When you begin your quest to delutter, know that it will be a time investment. Living simply does not come easily for me by any means (seriously, I am not an organized person), but the effort has been well worth the investment Thankfully, I have found that my time investment not only pays in peace of mind, but can also pay in actual money. 1.) Have a specific goal for the money. 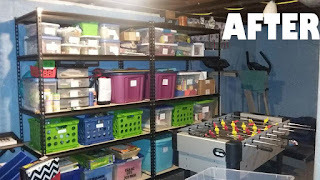 Having a specific goal helps in any project, but especially when you are a decluttering. Knowing where the money goes will give you motivation in the journey. Keeping your goal in mind can be the difference in keeping something you on the fence about, and decluttering it. I made $225 from decluttering this basement area, which was enough to buy these two new heavy duty shelves. Price using garage sale prices, or storing items to sell is just adding back to the clutter!!!! Do not be blinded by what you paid for it, that is a one of the biggest obstacles to decluttering! I sold a solid oak table for $125, even though consignment stores sell the same table for about $350 to $400. I had kept it for several years hoping to use it my "dream house" someday even though it didn't fit in my current house. I also kept it because I knew how much I MIGHT be able to sell it for if I cleaned it up and really marketed it. 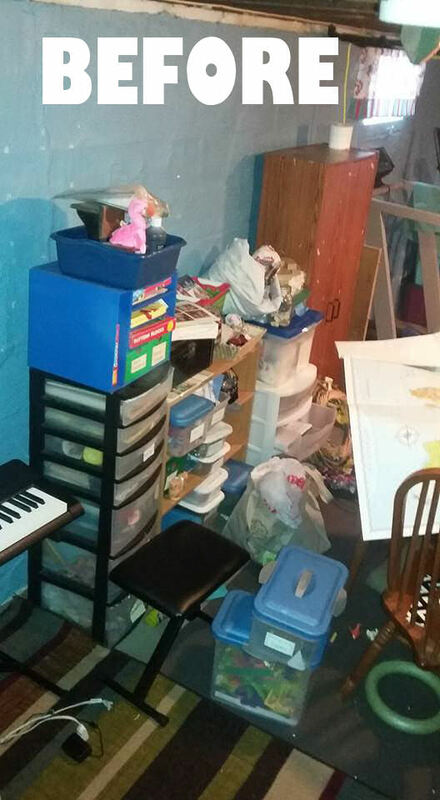 That IS NOT DECLUTTERING, that is opening a second hand store. The real goal here must be to get rid of things that steal your peace, making a little extra is just a bonus. 3.) If it's worth less than $10, donate it (remember to get the tax deduction receipt). I have tried every different online selling site, and anything under $10 is just not worth the headache of scheduling pick ups, or storing until it sells. My time is also money, and the time scheduling pick ups, tracking who is coming when, and storing items until they are bought is NOT WORTH IT. We LOVE Goodwill drive through donation centers. As soon as I get a bag packed to donate, it goes in my trunk. When I am near a goodill I drop off any bags in the trunk and get the receipt for tax deduction. Every year, those deductions add up to money in my pocket! I know some people have a problem with Goodwill, but I shop there regularly for my clothes, and am deeply thankful for people who donate their items! 4.) If it's worth less than $20, do bin pick-up at your house, or within a few blocks. I don't sell on Craiglist anymore, only Facebook marketplace. Convenience is important, but safety is key. Facebook marketplace allows me to see the buyer's profile, and also if we have any mutual friends. NEVER invite someone you don't know into your house if you are alone, ever. BIN PICK-UP-I have a waterproof plastic storage tub on my front porch. I put the the item in it the day of pick up, and buyer leaves the money in my mailbox. Easy peasy, and no opening my door to a stranger. I've never had anyone take item without paying, but if I did, oh well, I was decluttering anyways! I also have public library only 3 minutes from my house, so I do meet-ups there if I don't know the person, or we do not have any mutual Facebook friends in common. Occasionally I will meet someone father away, but only if I am already in that area for another reason. Remember, your time is money too. If over $20, I will travel a little father than the library or somewhere where I'll already be. I recently drove half hour to sell something, but it was a $75 sale, and worth it. I ran errands at stores near the meet-up while out and about. When selling our big table, they had to come to my house, but I made sure it was when my husband was home for safety sake.